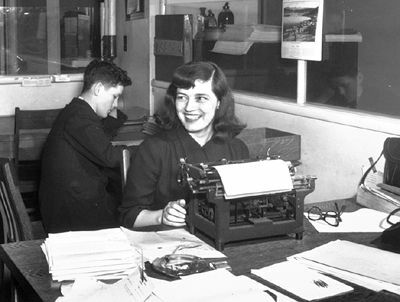 Mavis Gallant at the Standard, Montréal, May 1946 (courtesy Library and Archives Canada/PA-11524). I’ve never read a Mavis Gallant short story, something that, as I write this blog post, I’m ashamed to admit. But every so often I come across a mention of this escaped Cannuck — who has lived in Paris for over 60 of her 90 years — that re-asserts her importance in the world of writing. As a result, I have a certain sketchy understanding of her life through the Globe and Mail, the Walrus, the National Post and other media outlets. The first time I really took notice was in a charming 2008 radio interview on CBC’s Writers and Company, but it wasn’t until last week, when I listened to another CBC radio interview on Ideas, that her life strongly resonated with me. She seems to have achieved something that I find deeply admirable — independence — and I wish I knew how to do the same.